With modern society’s hectic scheduling and the constant rivalry of the rat race, many of us professional trainers are being asked to train gun dogs to handle many different varieties of small game. The modern small game hunter has limited time, resources and space in the family setting to allow them only one hunting companion. Thus, we, as professionals are asked to teach our students how to work and handle various types of small game. Turning our pupils into a multi-purpose sporting dog in the field, educating and refining them to become very productive “all around gun dogs” is the expectation of our clients. Naturally, not only are the pro trainers under more demand as to their diversification in their training programs. Lets not forget the professional breeder who now has an even more challenging task to fulfill. Not only is he challenged with the task of developing a hunting companion that can be a good citizen in the family unit, but now are faced with refining their strain of dogs to handle “all aspects” of small game hunting. The art of selective breeding gun dogs with exceptional intelligence, hunting ability and a strong desire to please, incorporated with a soft demeanor for the family setting must now become a standard in this industry to meet all of the expectations for today’s small game enthusiast. The spaniel’s uncanny ability to find game and a natural instinct to retrieve is a combination unmatched in the field today. The spaniel’s versatility and strength in both the field and the duck blind has given them the notoriety as one of the best “all around gun dog”. 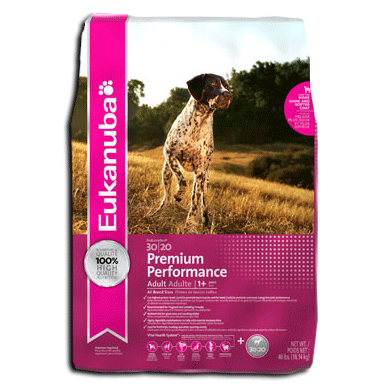 However, it is not only genetics that can give any sporting dog such a prestige title. Much time and effort must go into the structuring of a well-managed training program. Naturally, each spaniel is an individual with a different temperament, maturity level and socialized and raised in many different lifestyle environments. Professionals will treat each dog as such an individual, thus each spaniel has it’s own unique training program designed to make that individual dog a successful “all around gun dog”. Training a spaniel for waterfowl is not much different than the programs used in teaching retrievers. However, with spaniels they are usually taught the upland game hunting first. Many spaniels have graduated from their training programs and are ready to have their first season of upland birds as early as nine months of age. After a good hunting season the spaniel will return the following training season for possibly additional advanced upland training along with their waterfowl-training program. This will give the spaniel ample time to mature and become very aggressive on finding and retrieving harvested upland birds. When the second training season arrives, the spaniel now has quite significantly matured and with it plenty of drive and enthusiasm. We now can begin to take them through the non-slip retriever training process. Naturally, you, as the owner, must take some time to consider what type of waterfowling you intend to do with your spaniel in the upcoming fall season. Then schedule an appointment with your trainer to discuss your training options to meet your desired needs. There is no reason to have unnecessary training schooled. For instance, if you are not going to hunt from a boat while waterfowling, there is no reason to teach your pup how to work in and out of a boat. This type of information is crucial to your trainer. It can save him lots of precious time and additionally will save your resources for those decoys you will need to purchase for the upcoming season. 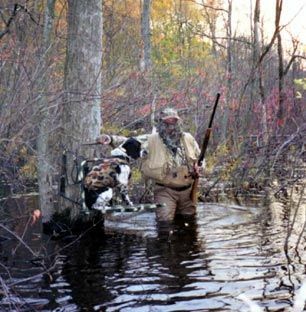 Spaniels are many hunters choice for early season waterfowl. Lets take some time here to review some of the basic training techniques that should be part of your training program should you wish to have your spaniel schooled to work waterfowl. Probably the first and foremost thing is to have a spaniel that will stay put until all of the ducks are down in the water, then retrieve only when told to. This is a very common problem that is faced by all first time waterfowlers. Their dog has exited the boat and is off into the pond as soon as the guns go off. How many times have you shot at a flock of ducks as they landed into your decoy spread then several seconds later another flock comes landing in right behind the first flight. Many experienced waterfowlers will always wait several minutes after shooting in anticipation of the second flock to arrive. Then and only then, are the ducks retrieved. The spaniel should be disciplined to the point that he will only retrieve when he is told to. Additionally, teaching him to honor while another dog does the retrieving of some harvested ducks will assist in keeping him honest to only retrieving when you want him to. Whether you are working out of a blind or boat, he must be trained to remain still. For those who will be using a boat, the spaniel must additionally know how to exit and enter the boat to make a successful retrieve.